Frank Sinatra stars as Tony Manetta, a widower living well beyond his means, in Miami where he’s raising his young son, Alvin (Eddie Hodges). With a limited understanding of the word “responsibility,” Tony, finding himself in debt and with his back against the wall, decides to reach out to his older brother, Mario, for yet another in a string of loans, fabricating that the money is needed for Alvin who has taken ill. The plot takes full-swing when Mario and his wife decide to pay Tony and Alvin a visit. In the tradition of It’s A Wonderful Life, Mr. Deeds Goes To Washington, Pocket Full of Miracles, director Frank Capra weaves a comic tale filled with heart, laughs and love … and introduced the classic standard “High Hopes” to the world. 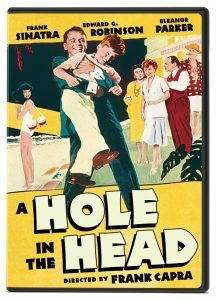 A pair of Franks make an agreeable meal in A Hole in the Head, the movie that brought together messrs. Sinatra and Capra. While Sinatra was on his movie-star hot streak, Capra had been out of film for a few years, having conquered Hollywood in the 1930s and then fallen out of love with it. Capra found in Arnold Schulman’s stage play a different kind of hero from his past Mr. Deeds and Mr. Smith: a Miami hotelier with big debts, young son, wayward eye, and, well, high hopes. The role fits Sinatra like a blue-eyed glove: he dodges creditors while hoping for a handout from his disapproving older brother (Edward G. Robinson), who in turn strongly wishes his younger sibling would settle down with a nice widow (Eleanor Parker) instead of a free-spirited, bongo-playing kook (Carolyn Jones). Meanwhile, kid (Eddie Hodges, from the stage version of The Music Man) believes in his old man, to a fault.